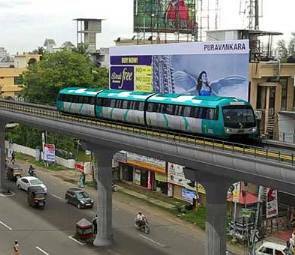 Kochi: Coaches of the Kochi Metro Rail, the design for which will be unveiled by the Chief Minister here on Thursday, will be the most modern in the country, with the capability to be converted into driverless coaches in future. According to the Kochi Metro Rail Limited (KMRL) authorities, they will also be the most cost-efficient coaches procured for any metro system in India. The Kochi Metro trains will consume less energy when they accelerate and provide high regeneration during braking. In addition, the communication-based train control system will drive the train at optimum energy-saving speed. It also has the key features needed to upgrade to the driverless mode in future. The stainless steel car body facilitates easy maintenance, durability and robustness, with a low noise-level. The trains are designed for a minimum of 35 years of service life. The KMRL has appointed Tata Elxsi as the design consultant for enhancing customer experience in the metro system. The contract to build and supply 25 state-of-the-art trains for the KMRL was awarded to Alstom in October 2014. Alstom is in charge of the design, manufacturing, supply, installation, testing and commissioning of the standard-track-gauge trains, with an option to supply 25 additional metro sets. Each train will be composed of three cars of about 65 metre length, with capacity to carry up to 975 passengers. The Metro cars will be manufactured at Alstom’s facility at Sri City in Andhra Pradesh. Delivery of the cars for the Kochi Metro Rail will be one of the fastest in the world, with an initial delivery period of only eight months. A high-level meet to be chaired by Chief Minister Oommen Chandy here on Thursday will try to resolve the latest bottlenecks in the implementation of the Kochi Metro Rail project, including the dispute between the Greater Cochin Development Authority (GCDA) and St. Albert’s College over land usage and the remaining land acquisition hurdles before the State’s ambitious venture. The work on Kochi Metro’s International Stadium station and adjacent pillars had been affected after the GCDA insisted on the State government handing over land near the first Goshree bridge to compensate for the 65 cents it had to give to St. Albert’s College in the stadium. N. Venugopal, Chairman of the GCDA, said on Wednesday that the authority was ready to hand over the land to St. Albert’s but on a condition that the government should give GCDA 72 cents near CMFRI located next to the first Goshree bridge. “We will also bring the unilateral stance adopted by the college authorities in this issue before the Chief Minister at the meeting,” he said. KMRL sources said other issues to be discussed at the meeting included the deadlock over the transfer of 17.31 acres owned by the Public Works Department at Kakkanad; approval for the water transport project for funding from KfW, the German funding agency; and approval of the Unified Metropolitan Transport Authority (UMTA) Act. Mr. Chandy will also unveil the interior and exterior designs of Kochi Metro coaches along with the new brand identity of KMRL at CIAL on Thursday.